﻿ Bay Landing Hotel, San Francisco (CA) | FROM $102 - SAVE ON AGODA! "This hotel is always clean, great location, staff friendly." Have a question for Bay Landing Hotel? "Nice hotel, close to SFO airport"
"Very courteous staff - especially the woman who works the night reception desk." "The staff are great especially Lynn Verango." Situated near San Francisco International Airport, Bay Landing Hotel is the perfect place to experience San Francisco and its surroundings. From here, guests can enjoy easy access to all that the lively city has to offer. For sightseeing options and local attractions, one need not look far as the hotel enjoys close proximity to Millbrae Subway Station, San Francisco International Airport, and San Francisco International Airport Subway Station. Bay Landing Hotel offers impeccable service and all the essential amenities to invigorate travelers. Disabled facilities, Wi-Fi in public areas, a car park, business center, and elevator are just a few of the facilities that set Bay Landing Hotel apart from other hotels in the city. Step into one of 130 inviting rooms and escape the stresses of the day with a wide range of amenities such as satellite/cable TV, internet access, ironing facilities, and air conditioning. The hotel's fitness center and golf course within three kilometers are ideal places to relax and unwind after a busy day. Whatever your reason for visiting San Francisco, the Bay Landing Hotel is the perfect venue for an exhilarating and exciting break away. "The room was lovely and had a stack of pillows - yummy ones,..."
Close to airport and a few restaurants. The rooms are comfortable, we stayed there for two nights before we started driving from SF to LA. Staffs there are nice and the breakfast is better comparing with other same level hotels. Highly recommend. Neil at the front desk is awesome. I was on a business trip and my wife came with me. Neil took care of us and made sure we had an excellent stay. The hotel, though a little aged, is well maintained and clean. The room-mate did a very good job in keeping the room good. The room is spacious and has a good view to the SF Bay and airport runway. The breakfast was better than average and food always filled up. The shuttle bus drivers were very courteous, helpful, and provide lots of information about taking public transits. Highly recommended. Just for guests coming from SFO and want to take shuttle bus. The schedule is every 35 minutes. If the guest arrives late, better dail the shuttle bus phone #14 (available at the shuttle bus waiting bay) to confirm the availability. We enjoyed our stay at this hotel. Their baggage storage was efficient which we used before and after check in. The bed was comfortable, the room quiet and internet good. The breakfast was good and the tea and coffee available all day appreciated. Excellent location to SFO. Wish they would have breakfast b-4 6:00 am. Helpful staff, clean and well-kept. Spacious modern room. OK breakfast. Free shuttle to & from SFO at almost all hours. Good Internet & cell phone connections. Pricey but probably OK for location. The hotel was clean, had helpful staff and a good range of facilities. There was a laundry to use yourself, hot drinks available and a spacious room. The bed was comfortable and breakfast had a wide range of food available. They looked after our luggage securely after we had to book out and provided a transfer to the airport with a very regular timetable. I would recommend this hotel to people who want to stay near the airport. Used the included shuttle to and from airport which was on time and the driver was helpful. Booked standard room which was fine for our 1 night stay, comfortable and quiet. Breakfast was nice. Would stay again. This was a great spot...we just needed a spot for overnight, so I was looking for a spot to fit our budget, but I couldn't have been more thrilled when we checked in..good location, beautiful decor, our room had a great view, and the windows opened, but were double-paned, so NO noise from SFO, which is a stones-throw away. My husband and tend to be "hot sleepers", the A/C was positioned high on the wall, so we had cool air wafting down to us all night, and the A/C was SILENT....no clicking on and off, no vibration. Breakfast was also a pleasant surprise, not just a cellophane-wrapped pastry and coffee...they had a full-on hot, freshly cooked, ample variety of foods. They also had a small, well appointed gym, and the walking path that goes along the Bay for a few miles was right outside. Loved our stay here! Bay Landing is convenient to SFO and was close to the conference center (my purpose in traveling), and was very well priced compared to other nearby hotels. It's an older hotel with a quaint charm, and an odd mix of dated and updated decor and amenities. The bathroom had nice granite, while the room itself had peeling, faded wallpaper. The king bed was comfortable. The free hot breakfast was a very welcome option. There's a nice exercise room (no pool). It's situated directly on the bay and adjacent to a public path, which was a nice surprise; we were able to get in a couple of good walks. The staff were pleasant and helpful. A few negatives: the single in-service elevator is very slow, the in-room refrigerator was noisy and not very effective. The general area outside the hotel location is what you'd expect from being near an airport, so don't expect any real neighborhood attractions; the location is utilitarian. Overall 5/5 value, view from a bay-facing room, and convenience. Hotel was very convenient to the airport. Uber to Fisherman’s Warfe area for two persons was about $38. Not many restaurants within walking distance. Great walking path along the water right outside the hotel. Room had an excellent view. Staff was kind and helpful. This hotel was a good location to the airport and had free parking! We traveled back and forth to Fishermans Wharf and the bridge area to do our activities and besides the traffic, it was not bad. We traveled in October and did not have trouble parking at our locations. Breakfast was good, but we wished they had a pool/hot tub. Front desk staff were very nice, but housekeeping wasn't the best. They did not wash our coffee cups or leave us coffee for the next day and extra blankets we used were just thrown on the bed (as opposed to being folded). Not a big deal, but just a little detail. We also found items just under the edge of the bed from other guests. 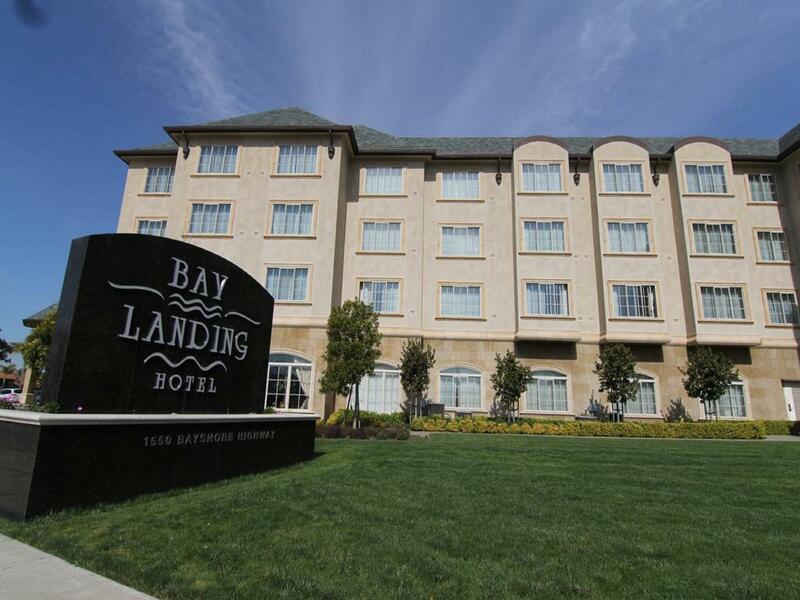 Bay Landing is outstanding comfort and value and a convenient 10 minute ride from SFO. The breakfast was an added plus and delicious. Our only negative was with the hotel's airport shuttle. We arrived late Saturday evening (~ 10 PM) and although we were promised a 35 minute schedule for the shuttle, no bus turned up after a 45 minute wait. After 2 phone calls to the hotel we gave up on the promised bus and took a taxi instead and were out of pocket $20.